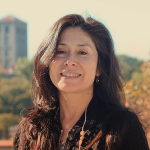 Maria Bernales-Korins, PhD, LMHC received her doctorate in Clinical Psychologyfrom Fielding Graduate University, and her Master’s Degree in Psychology from Fordham University. She has provided direct clinical services at ICS for over 18 years. She is currently the Director of ICS’s Child and Family Prevention and Wellness Program – a Primary and Direct Prevention Initiative. The program offers evidence-based interventions for children and families at risk for developing problem behaviors, substance abuse, and mental disorders. Dr. Bernales-Korins graduate studies in psychology included significant course work in health psychology. She is a yoga and mindfulness mediation practitioner, and had the opportunity to deliver the Mindfulness-based Eating Awareness Training program to mental health clients during clinical internship at ICS. Dr. Bernales-Korins, provides psychotherapy utilizing CBT, mindfulness-based CBT, interpersonal/psychodynamic, and motivational interviewing approaches and health psychology and prevention perspectives that are culturally appropriate/ relevant.